Do you feel like you’re on the outside looking in? Are you just waiting for someone to invite you, yet the door remains closed, the mailbox empty, and the dress left hanging in the closet? Has rejection ever wrecked your week? Or maybe it’s stolen a whole season, leaving you weak in spirit? 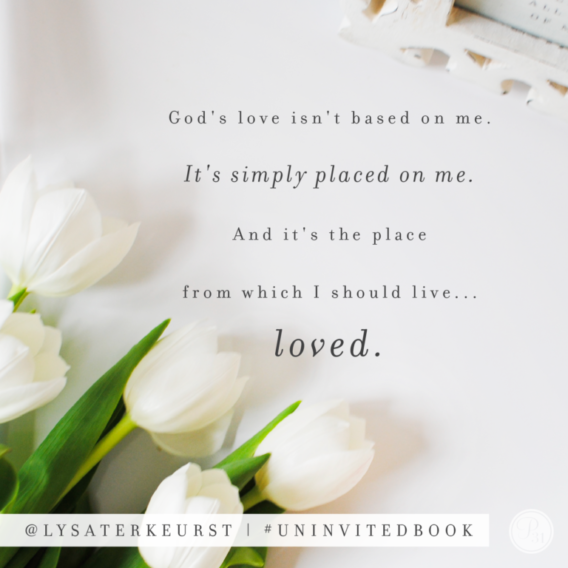 This post is part of Lysa TerKeurst’s Uninvited Book Blog Tour which I am delighted to be a part of along with many other inspiring bloggers. To learn more and join us, click here. I got another “no” on my writing. Two closed doors in one week. Awesome. And it was just not a good day to get a “no”. It didn’t fit into my frantic and frazzled day. You know the kind, right? When you’re on edge on the inside and the kids aren’t cooperating and you’re trying to get too much done, and you’re continually losing your temper; yelling and apologizing, repeat. 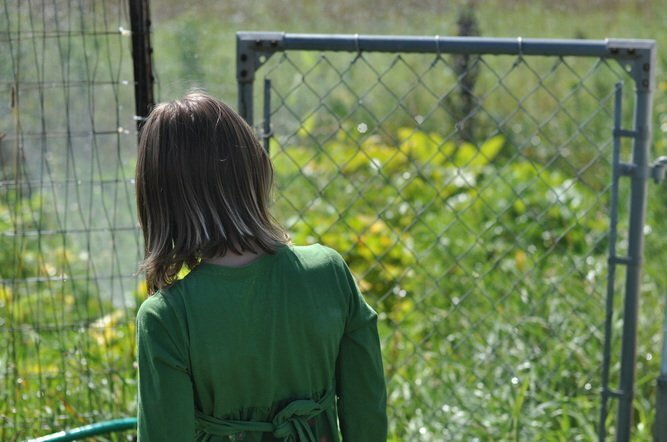 This Tightly Wound Woman has days like this more often than she cares to admit. When we get a “no” we can throw a tantrum, throw in the towel, or throw up our hands in worship…and keep going. I had a few “thought-tantrums”. You know the kind, right? When you yell and kick and shout silently, acting like a spoiled toddler who didn’t get to ride the penny horse at the supermarket. I was discouraged; not gonna lie. On one hand I expected the rejection, the unwanted house guest who shows up at the most inopportune times. But on the other hand, I thought I’d be invited—chosen to utilize my talents and asked to come sit at the head table. The “yes” didn’t happen—this time—but that doesn’t mean I’m unloved or overlooked. Just like a toddler seems to question a parent’s devotion when their every request isn’t granted, we sometimes question God’s love when we don’t get our way. You can be confident, because God is faithful. Lean into God’s faithfulness and hold your head high, because the One on high holds you. This does not mean everything is going to turn out the way you want it to. But it does mean that you can trust the One who goes with you. Rejection can make us weep or it can cause us to reap truths from God’s Word. May we dig into God’s promises instead of digging our heels into discouragement. And then there’s that song, “The God of angels armies is always by my side.” This should bring us great confidence that God, who has angels armies, is right by our side, right now. We live in a world where we can be unfriended, unfollowed and unliked, but there is One who sticks with us, closer than a brother. A friend who will not leave or forsake us. Jesus is the best, most famous person you can and should follow. He loves to listen to you. He is interested in what you think. He is not bored by your status updates, but He cares more about your heart than your latest selfie. He loves that self. He loves you. Jesus lived and died for you and rose again to be in an everlasting relationship with you. Because He is faithful, you can be confident. Don’t let rejection wreck your week or make you weak. You’re invited into His love. Be assured of God’s acceptance of you through Christ’s atonement for you. Don’t give up, because His love never gives up on you. Take your place at His table as Jesus makes Himself at home in your heart. Even when you’re overlooked by others, you are handpicked by God. 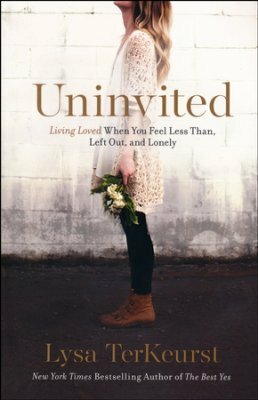 In her new book, Uninvited, New York Times bestselling author Lysa TerKeurst will help you live like you really believe that truth! You can get your copy by going to www.uninvitedbook.com. You might also like this much-needed reminder that kindness can be found in God’s “no”. Subscribe to my blog to receive encouragement into your inbox, for free! Let’s open the door and find grace in the unraveling, together. « HAPPY Anniversary Five Minute Friday!